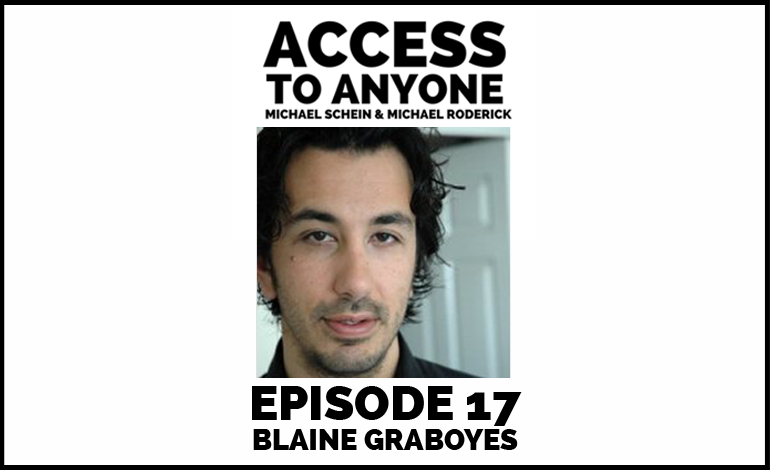 As a trailblazing digital producer and video game designer, Blaine Graboyes knows what it means to thrive on the cutting edge of technology. By embracing risk and capitalizing on cool, new concepts, he’s built an award-winning career with a wide range of connections. Today he reveals how to hack into the gaming subculture, and why contribution in any form is the key to gaining access to powerful players and building influential relationships that endure the test of time. Getting in tune with your intuition. How to manage your time at both a micro and macro level. The best approach for saying no to projects. Blaine Graboyes is an award-winning Executive Producer and Game Designer with more than twenty years of experience developing successful digital entertainment products. His expertise spans the business, creative, and technical aspects of launching and successfully operating video games, websites, social and mobile apps, entertainment properties, and fan communities. He has produced over 4,000 digital projects for world-renowned entertainment, business and fine art clients, including DreamWorks, Mattel, Spin Master, Sony Pictures, Disney, Nickelodeon, LeapFrog, DIRECTV, Warner Bros., The Guggenheim Museum, Nam June Paik and Yoko Ono. Blaine is currently the CEO of GameCo, Inc., a pioneering new company poised to unite skill-based video games with real-money casino floor gaming, has created the world’s first video game gambling machines (VGM™) in an effort to bring a new generation of gamers to land-based casinos.